Corna was part of the legendary Pro Vercelli team at the start of the 1900s. He formed a great couple with his teammate the left-inside Carlo Rampini. Corna played for Pro Vercelli from 1909 to 1921, scoring 43 goals in 115 matches, and capped for Italy 8 times. He was a short and stocky player known for his playstyle: he was extremely fast, a sort of counter-attacker ante litteram, and was also an able assist-man; he didn't fear his opponents in fact he used to be a rough attacker whose acts against his marker were sometimes even violent. 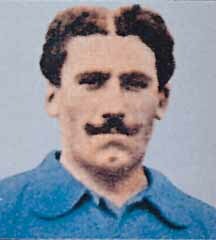 He retired in 1921 after a match against Inter ended in a brawl because of a bad foul he committed on Antonio Da Sacco.